The North Carolina Early Intervention Branch (NCEI) is a part of the N.C. Division of Public Health. It is the lead agency for the N.C. Infant-Toddler Program (ITP). The Infant-Toddler Program provides supports and services for families and their children, birth to three who have special needs. Research shows that this time period is critical. It offers a window of opportunity to make a positive difference in how a child develops and learns. Eighteen Children's Developmental Services Agencies (CDSAs) across North Carolina work with local service providers to help families help their children succeed. North Carolina’s Early Intervention-Early Childhood Library houses a large collection of print and video materials that focus on young children with special needs and those who are typically developing, their families, and recommended practices for serving them. There is also a special collection of children’s books! These materials are available for loan to professionals and parents in North Carolina. The North Carolina Early Intervention-Early Childhood Library also houses the Partnerships for Inclusion collection of library materials that focus on quality childcare and the promotion of inclusive opportunities for young children with special needs. Easter Seal's mission is to create opportunities, promote individual choice, and change the lives of children and adults with disabilities by maximizing their individual potential to live, learn and work in their communities. In pursuit of that mission, four core values guide their efforts: Integrity, Respect, Responsibility and Innovation. By utilizing these core values in all they do, they are assured that the personal outcomes of those they serve stay at the forefront of their daily activities. The Down Syndrome Association of Charlotte (DSAC) is a non-profit, family support organization.The goal of the DSAC and it's families is to enable individuals with Down syndrome (Ds) to reach their full potential and become respected members of their community. The mission of DS Association of Charlotte is to enhance the quality of life for all individuals with Ds by providing information and support to families, professionals and the community through educational and social activities. 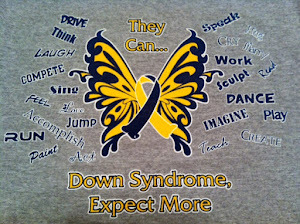 The Down Syndrome Network of Greater Greensboro is a group of parents who are committed to supporting one another, sharing important information, and advocating for the very best in school and community services for children with Down syndrome. The non-profit Piedmont Down Syndrome Support Group provides support and information to parents of children with Down syndrome in the Piedmont area. Their aim is to support each other and enrich the lives of our children so they may reach their fullest potential. The group meets periodically to encourage and strengthen each other, by striving to increase our knowledge, understanding and hope about Down syndrome. They host guest speakers and share new information, ideas and advice to become better advocates to our children. Triangle Down Syndrome Network exists to support and connect families of children with Down syndrome by organizing and promoting activities. TDSN is striving to make a presence in the community. We want to ensure all people with Down syndrome have happy and productive lives. Located in central North Carolina, serving families in Wake, Durham and Orange and surrounding counties. The mission of the Western North Carolina Down Syndrome Alliance is to help create a community that will be educated, supportive and inclusive of individuals with Down Syndrome. On June 13, 2001, their daughter, Anna, was born with Down syndrome, a chromosomal abnormality which occurs once in approximately 733 live births. In November 2002, they received the devastating news that Anna had Acute Myeloid Leukemia (AML). They had known from her birth that she ran a higher risk to contract this type of cancer. Through the difficult time of chemotherapy and recovery we got to know how incredibly strong our little girl is and we also learned a lot about both Down syndrome and AML. They were amazed at how little is known about the two conditions and how they are related. This service provides comprehensive data and referral assistance for nonprofit and government resources in the NC counties of Mecklenburg, Cabarrus, Union, and Anson counties and in or near the city of Mooresville, NC. If you are calling on a landline or residential phone in one of those counties, dial 2-1-1. If that fails, if you are calling on a cell phone, or if you are calling from anywhere else in NC, call 866/744-7778. For calls from out of NC, use their local number of 704/377-1100. Although they are open 24 hours a day, you may wish to call weekdays from 8 a.m. to 7 p.m. for non-emergency questions. The Arc of North Carolina has been providing advocacy and services to people with intellectual and developmental disabilities since 1953. The Arc believes that all people with intellectual and developmental disabilities have strengths, abilities and inherent value, are equal before the law, and must be treated with dignity and respect.